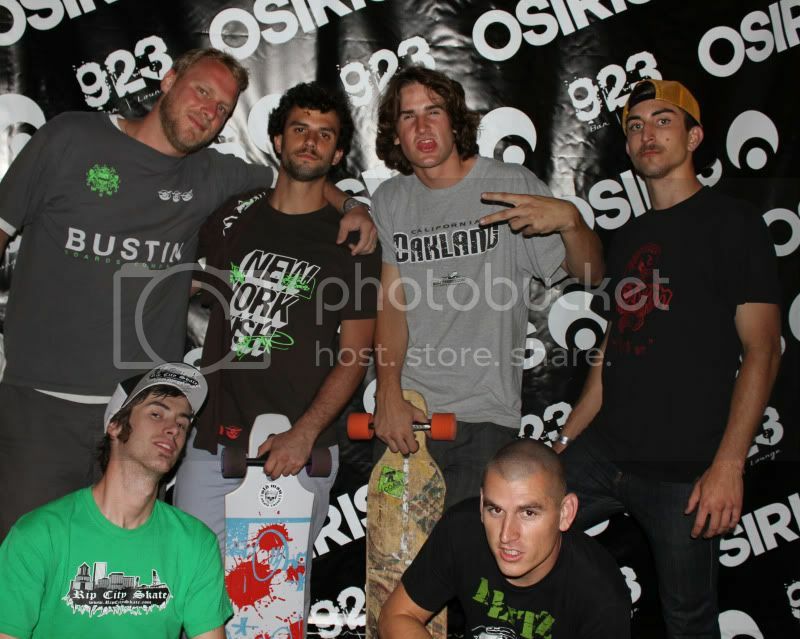 Mike and I rolling into the Osiris party at ASR with James Kelly, Andrew Mercado and friends. Here I am, sitting in the San Diego airport after five action packed days of business on the West Coast. 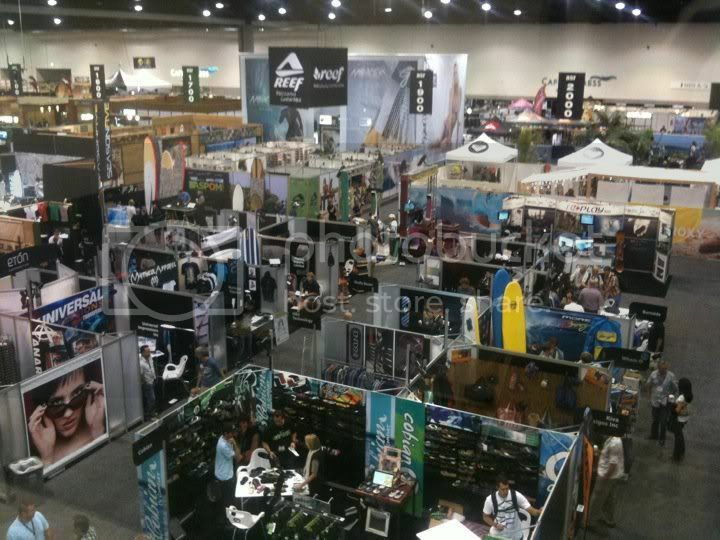 Our trip revolved around the ASR trade show at the San Diego Convention Center, but our purpose for coming was a bit different than most in attendance. For some time now, we have been wanting to take a trip out west to connect with some of our friends and vendors. As most people know, the traditional hub of the longboard world is located in Southern California so many of the products we make and buy originate there. And the ASR show is where some of the people behind the products get the rare opportunity to get together, drink beers and rap about skating and business. One of the real pleasures of working in this industry is how friendly and cooperative the competition is. Whether I was bombing parking garages with Nate and Ryan of Landyatchz or getting fatherhood advice over beers from Pablo of Loaded, hanging with these guys is truly like hanging with great friends. I know Mike wrote a recap of the trip already, but I wanted to give my perspective on the trip and give some shout outs to some of my people from the trip. We started the trip in LA, meeting with Labeda to talk about some new wheel ideas and take a peek at their operation. During the last few years, I’ve probably clocked over 10 hours of phone time with Rob and finally met him in person for the first time this week (a couple days after he nearly lost his hand in an accident, Rob is a bad_ss dude for real). We rapped about some new ideas we’re working on and were able to see first hand what the capabilities of their operation are. As usual, everyone at Labeda was super cool and they are an awesome example of a growing American manufacturer. Mike and Rob talking wheels at the Labeda factory. 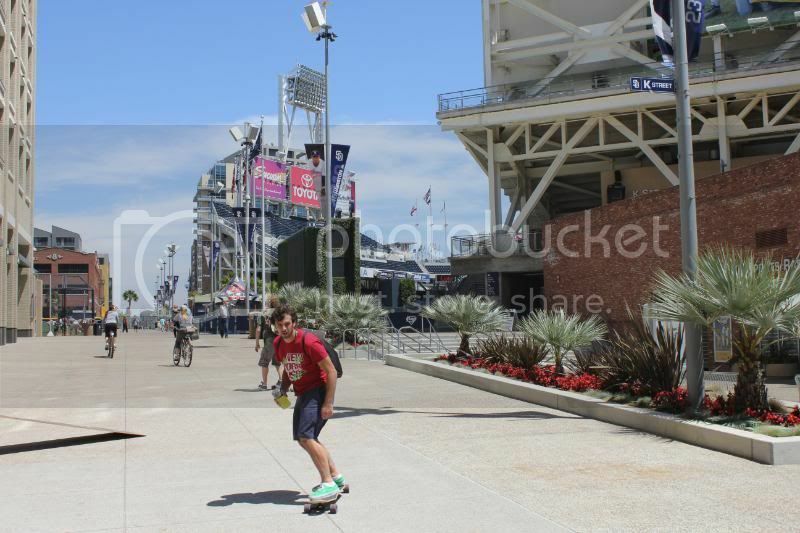 From there we split down to Huntington Beach and hooked up with our boy Andrew Mercado. After a very long night of skating and beach bar hopping, we hit the road heavy the next day with Andrew visiting several manufacturers (secret ideas under way) and a few local shops. At Jack’s Surf Shop I popped the trunk to show one of the staff members a board and within minutes the entire parking lot looked like a GF Hurley ad with teenage bare foot, long hairs ripping all around the parking lot. The spectacle became so huge that people began stopping their cars and asking “what kind of boards are those?”. Its amazing that in the land where longboarding was born there is still such a lack of diversity of brands. In fact, when we first walked in the shop and told the guy we made longboards, he actually said “cool, you guys ever heard of Sector 9?” Great question. As we were leaving we noticed that one of the kids we gave stickers to had already found a sweet spot on Jack’s brand new window dressing. Pretty funny, but I pulled it off before drove away. We came out here to make friends, not vandalize our customer’s shops. After that it was show time so we headed down the coast towards San Diego. Friday morning we checked into the show and I suddenly remembered how obnoxious the entire thing actually is. Cool kid pop hip hop blasts like a club while thousands of teenagers with sunburns and flat brims blend with hundreds of models on pedestals in trendy bikinis. Um, no further comment on that, just google ASR show if you don’t get it. After sticking our heads in the show quickly, we headed over to the Silverfish meeting across the street. The meeting was super productive and was a great chance for some of the longboard industry leaders to get together and talk about ways to make the industry safer and more sustainable. The main initiative this year was safety and we discussed creative ways to promote the use of helmets. From Chris Chaput to Michael Brooke, everyone at the table had something interesting to contribute. Look for some new initiatives from the industry to promote safer skating and more helmet use. I guess Swim Wear is a part of the Action Sports Industry? No, we're not working on longboarding bikinis yet. After that we headed over to the Crossroads section of the show. This show is the brainchild of Jamie Thomas of Black Box Distribution and is a creative alternative to the fluorescent light pop circus inside the convention center. 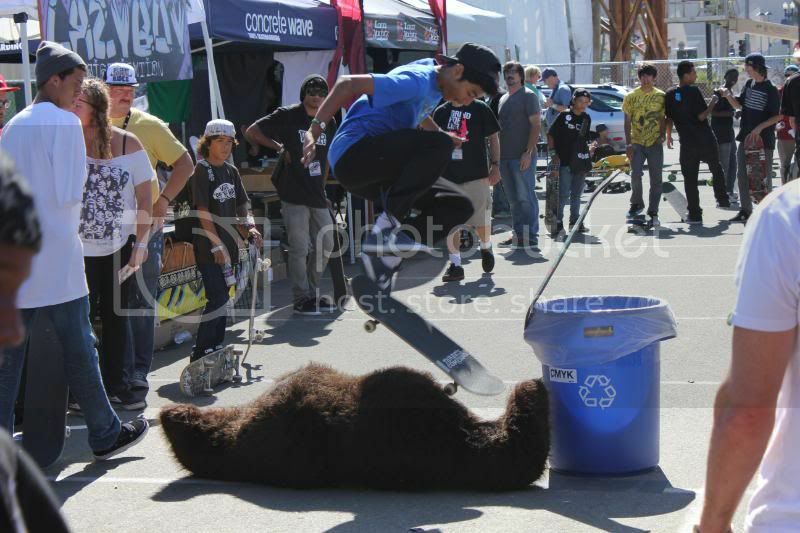 The show is located in the parking lot behind the convention center and is comprised of only skate brands. Our wholesale business is still small so we held out on getting our own booth but we had a great day hanging in the sun at the ABEC11, Landyatchz and Concrete Wave booths. We rolled around the two shows most of the day before meeting with Reggie and Jocelyn from Eastern Skate Supply at the hotel to rap about the year that passed and talk about some new agendas for our wholesale customers at ESS. Finally, after a long day of brainwork, it was finally time to have some fun. I quickly decided that I really like skating in San Diego, especially the downtown. The Gas Lamp district is located on a sweet little gradient making it a perfect push culture city ripping town. An easy traffic push up for as many blocks as you can handle is rewarded with a fast downward rip within 3 lanes of casual traffic back down to the convention center on the Bay. For as perfect as I felt the terrain was, I noticed right away that people were baffled by our skating style. It occurred to me that in the birthplace of longboarding “push culture” is still a strange idea. People seemed blown away to see us pushing fast, uphill in the street. After an hour or so of solid pushing we dipped back to the hotel for a quick rest before we headed out to meet the industry gang for dinner. Friday night is really the only night at ASR. Its the night that everyone is in town and pumped to be there. Everyone from the longboarders camp met at Fields restaurant and bar. Upstairs in the crowded bar it was all skate talk. 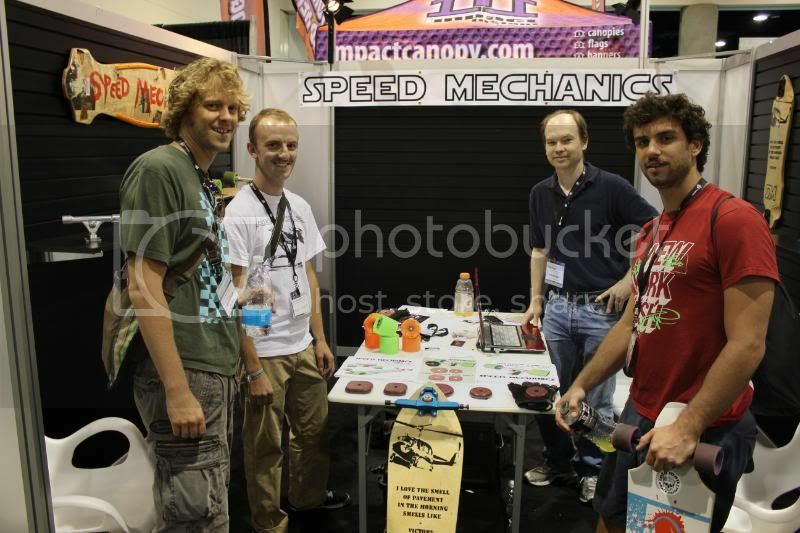 I talked South American distribution with Pablo from Loaded, laser etching with Brian from Soul Rydes, trucks with the guys from Speed Mechanics, marketing with Michael Brooke, distribution with Board Shop Australia and web world with Malakai from Silverfish. Within a few hours we were all talking louder and faster and ready to move up the street to the Osiris party. Mike bounced to meet Mercado, James Kelly and Luis Pilloni for a parking garage session. We met them all a bit later at the next party and mayhem began. Before long Michael Brooke and I were going outside on pretend smoke breaks just so we could hash out an idea that just couldnt be explained via shouting. Finally the night caught up to us and we all said our goodbyes and rolled out. When we got back to our hotel room Mike and I got a sobering second wind and took off for night cap skate through the circus of the San Diego Gas Lamp district on Friday night. After a nearly successful attempt by Mike to get us in the VIP entrance at the Hard Rock we ran into Andrew and James and then crushed 3 fully loaded California hot dogs. Needless to say the next morning we slept in late. The next day we all split up for a while and did some recovering. I skated off my pain with a few rips up and down the strip and soaked up that crisp San Diego air. Around lunch Rob, Mike and I rolled back into the convention center and started making our rounds. We talked event planning with EG from Sector, learned something about the first longboards from Biker at Dregs (FYI – awesome story on Biker in this months CW). 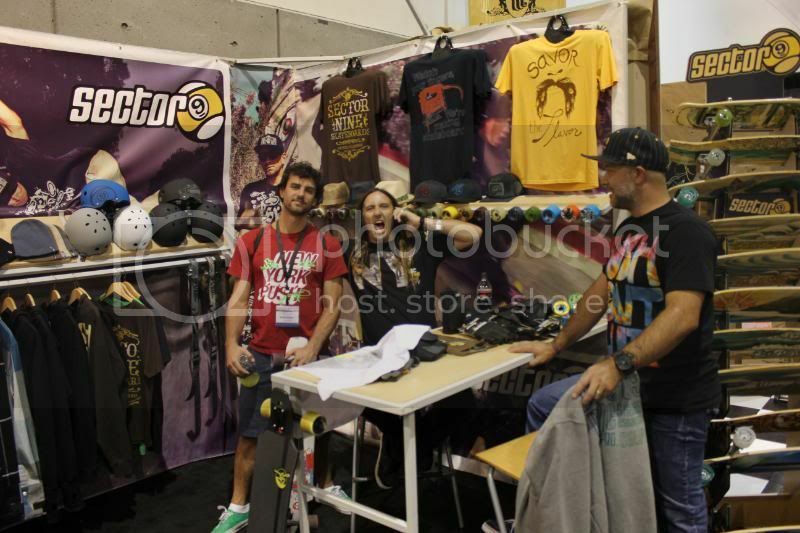 Biker and Kurt were so stoked on Push Culture longboarding they nearly hugged us when we rolled up to their booth. “You guys are setting the trends they said, we love you guys”. 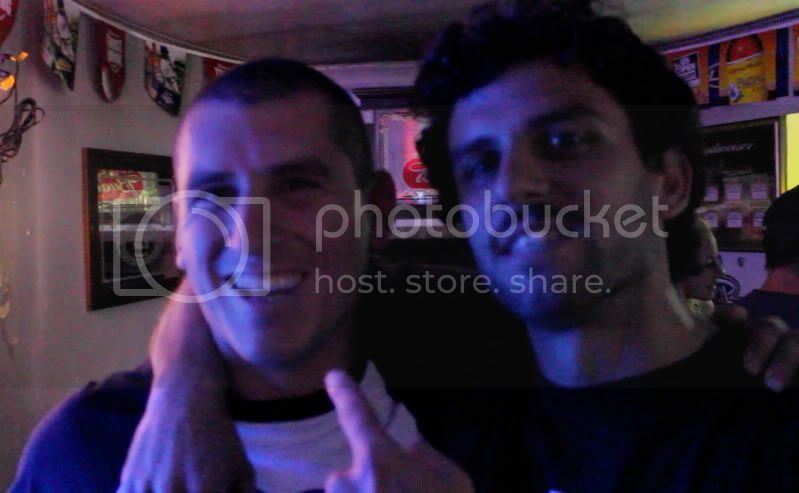 What an amazing feeling for me personally to have Biker Sherlock stoked to meet me. Little did either of them know that I met them 5 years ago when Bustin was more less and idea in my head and being in that tradeshow was like standing at the bottom of Mt. Everest. I used to go alone with my board and a home made Bustin shirt and try to learn how everyone was doing it. This time is was different. Everyone seemed to know about Bustin Boards and “Push Culture”. Biker Sherlock, one of the original Sector 9 backyard builders, even invited us to his house to skate the original hill that they first longboarded on. All the helmet companies knew who we were and wanted to be a part of our Brooklyn store, random people would stop us and ask “is that a Maestro?” and every few minutes we ended up stopping to give a pound to someone we knew. Times had changed and we all walked out of there with cheesy grins on our face. From there I rolled back over to Crossroads for a final visit with Concrete Wave, Landyatchz and ABEC11. There was a pretty sick trick competition going on in front of the CW booth and some local kids were fired up. One of the cool things about Crossroads is that they let the public inside, unlike the regular ASR show. It results in a super casual atmosphere and is noticeably much more casual and laid back. From there we jumped in the car and headed North to meet up with Brian at the Soul Rydes shop with no idea what was in store. His shop is one of the coolest places I’ve ever been. If you haven’t checked out Soul Ryde, you should. Their specialty is their laser cut graphics and their shop is like a candy store for a designer mind. 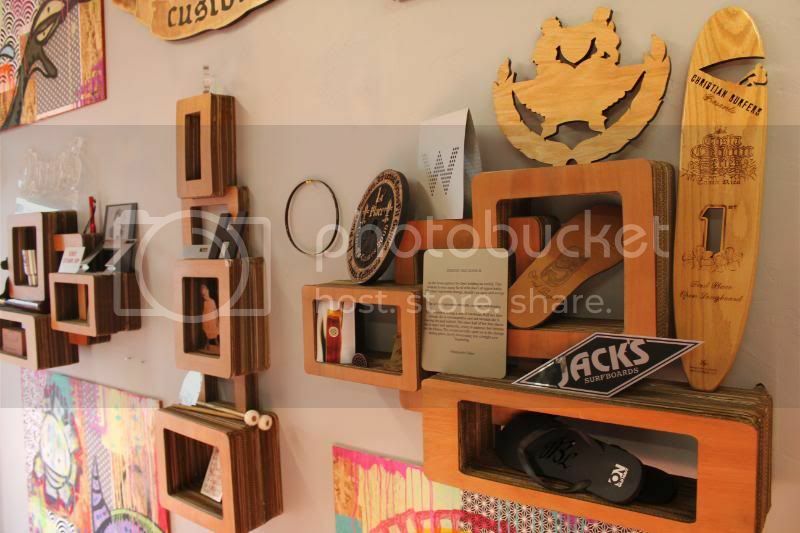 With their laser cutter than can cut everything from boards to grip to signs to cardboard shelves. Brian and his brother own the business and his brother is an unbelievable designer. Together, they are doing some of the coolest stuff I’ve seen and we’re already talking to them about some wild ideas for laser cut grip and some sick signage for our store. They were super chill and welcoming and it was a really cool getting to see their operation and some of the design work they are coming up with. After that we headed back to the hotel and discovered that our hotel had a super sick roof deck lounge for guests. While our intention was to grab a power nap before the big night, the allure of the fancy roofdeck squashed any hope for rest and instead resulted in an early start to another long night. Before long Ryan and Nate from Landyatchz had packed up their booth and headed over. We had a great time kicking it by the classy glass fire pit and joked about how a bunch of scrubby longboarders winded up in the ‘Entourage’ rooftop lounge setting. Later we all rolled out to dinner at the Brewery. Our server ended up being an old Sector 9 downhill racer and even had a S9 logo tattooed on his arm. For the second time during our trip someone said to us in full sincerity, “cool, you guys longboard. have you ever heard of a company called Sector 9?” This time I just spoke up and said “No, never heard of them, the only one I know is LANDYATCHZ”. Ryan and Nate from Landyatchz with Mike and I at the start of a long night. After dinner we grabbed boards and headed out. We were searching for what was apparently the most fabled parking garage in the Gas Lamp district. As we pushed around town I couldn’t help but be a little nervous about hitting a 12 story garage with the Landyatchz crew. I mean, these guys have been some of my heroes since I started making boards and I always assumed they skated twice as fast as me. Um, yeah thats true. Mike managed to keep up well but Rob and I definitely ended up a story behind by the time we were squashed by security. It was about 11 o’clock and there was a rumor that another crew was meeting for a midnight session at the top of this garage. We decided to wait at the outside bar adjacent to the garage so we didn’t get the security too red hot before everyone else got there. Suddenly we heard a subtle buzz of grippy wheels from the top of the towering parking garage. We had lost track of time and the 12 o’clock session had already started. It was kind of a surreal moment looking up at this towering building and just hearing the sweet sweet sound of urethane getting closer and closer. As they came down the hissing sound got louder and louder before they all shot out of the off shoot and fore away before we could even tell who it was. It all happened before we could do anything so we just sat there and laughed. A few more runs later, and a near death experience for yours truly, and I was ready to get away from the 12 story monster. at was getting late and we all set out on a sick 12 block downhill skate back down to our hotels. The next day was chill day. We had booked out tickets late so we couldn’t fly out of San Diego until Monday evening. Darn. We were trapped in one of the most beautiful places on earth with nothing to do for a day and half. Mike headed up the coast in the rental car in search of a mythical outlaw downhill race near Jeff Budros house, Rob took off on his board for Pacific Beach and I decided to keep it simple and stay the Gas Lamp. Even though I got beach pic text messages from both of them, I’m glad I stayed. I ate sushi and reflected on all the conversations I had during that last 72 hours and followed up with a sweet nap. That afternoon we all skated up to the famous San Diego Zoo and then had a super sick session in it’s huge, rolling parking lot. Built on a perfect hill and mostly cleared out by the time the sun was almost fully set, it was truly like being on a concrete mountain. Huge wide open gradient and perfect pavement. If hadn’t gotten so difficult to see when the sun fully set I could have skated that lot all night. We headed home and were surprised by some super chill hills heading down from Balboa park. After a sweet 3-4 mile downhill skate, we hit up the hotel roof lounge and kicked up our tired feet. Our boy Ari, who recently introduced himself in the Bustin shop after skating cross country, came over and hung with us. We all went out for another night session and then called it a game. 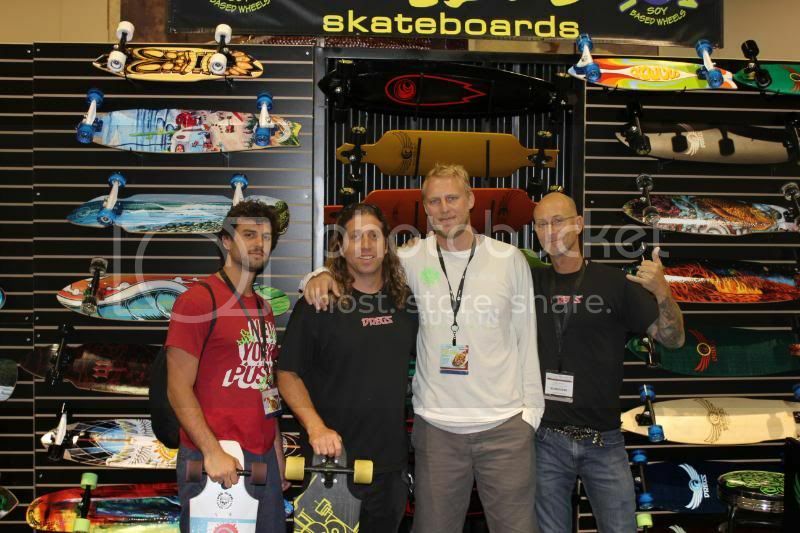 I’ve been to several skate trade shows over the years, but nothing compares to 2010 at ASR. I am really thankful to Jenica, Paul, Sol, Jeff, Adam, Derek and Jeff for holding things down at Bustin Headquarters and allowing Mike, Rob and I to get away. I am privileged to work with such an awesome crew who can handle things as smooth as butter while I’m away. I’d also like to give a shout out to all the leaders in this industry for being so chill and cooperative with one another. I’ve never known an industry comprised of so many cool, down to earth people. Finally, I want to shout out the longboarders that are making this industry what it is. When I went to ASR five years ago longboarding was still pretty much laughed at by much of the brands and stores. Today longboards account for one of the highest selling hardwoods at skate shops across the country and the shops are coming to us. Keep it going by supporting honest companies with innovative products and tell your local skate shop that you want more longboard selection. Pablo – thanks for excitement about the new pebble. you were cracking me up at Fields Friday night. what happened to you guys late night? Michael – your a mad scientist man and it was great to brainstorm with you. i’m pumped about all the new stuff your cooking up and really appreciate everything CW does for the industry. James – get an ID dogg. unlike everyone else at the show, those bouncers definitely didn’t care that you were the fastest skater on the planet. Andrew – thanks for the hospitality. it was eye opening talking to you about the industry and evolution of things. good luck starting the gig at Gullwing. Malakai – awesome rapping with you man. looking forward to getting you out to NYC soon! Hotel Indigo Staff – sorry we kept ruining your fancy hotel aura by being scrubby, sweaty skaters sliding up to your front door every other hour. Rob – watch out for that curb. Mike – wild in the streets dogg. Peace everyone, wish you were there. Dope Bustin (We go hard)Baby! Love it. Glad to hear it was productive and I look forward to catching you up on my progress as well.